Realm of Writing Korean Celt: Woman on the edge. That's me. I'm pulled so taut right now, I don't think it would take much to make me snap. I actually daydream about some guy making inappropriate advances on me in the elevator so I can have a reason to go off on someone just to release a little of the pressure. However, since the majority of men I encounter in elevators are meek professor types, it doesn't seem as if I'll be able to let loose on some unsuspecting perv. I'm a time bomb, folks. A time bomb. Why does Christmas do this to people? I can remember when I was a kid and it seemed like Christmas came so slowly and it didn't seem possible that I could survive the wait. Now, it comes so quickly I feel like the Christmas season needs to be at least two months long to get everything done. I haven't even sent my cards out yet because I haven't had time to finish addressing envelopes. I know these are petty problems compared to the people who have no family, no food or no home. But they're my headaches so they seem major to me. My daughter's Christmas concert was last night and she did a great job, I think. All the kids did a great job. Why is it so funny listening to kids sing? It is, though. You've got the kids who are putting their all into the performance like they're Mariah. It's great. One girl scared people in the audience beause she came in so loudly on her cue. People actually jumped in their seats. It was hilarious. Kids are funny. Anyway, that's all I have time for today. Keep on keeping on, as they say. 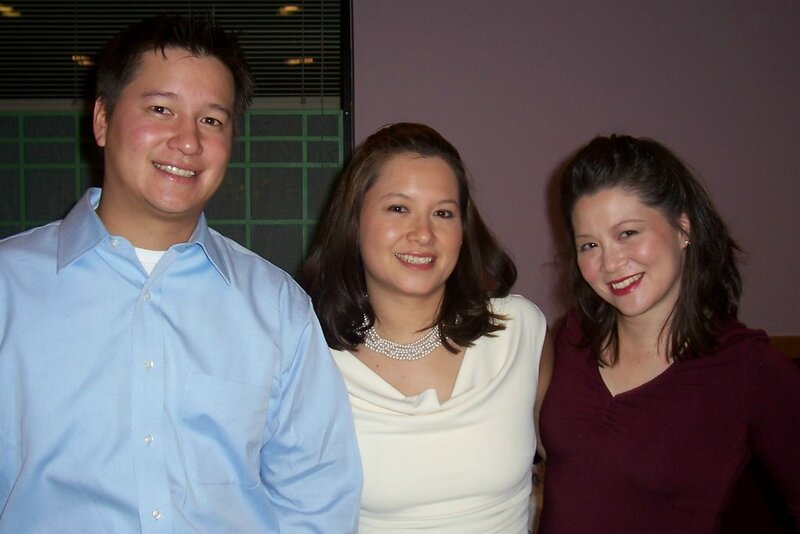 Oh, here's a picture of my brother, sister and me from our mother's birthday party this past weekend. Don't we look happy? Not frazzled, at all. If only it were real. If only we weren't crying behind the smiles.